A while I go I hinted that I might be restarting a personal project once the bulk of the work on our club layout was complete. This time has come, and on Friday I took delivery of two 4' x 1' 6'' baseboards - with legs. 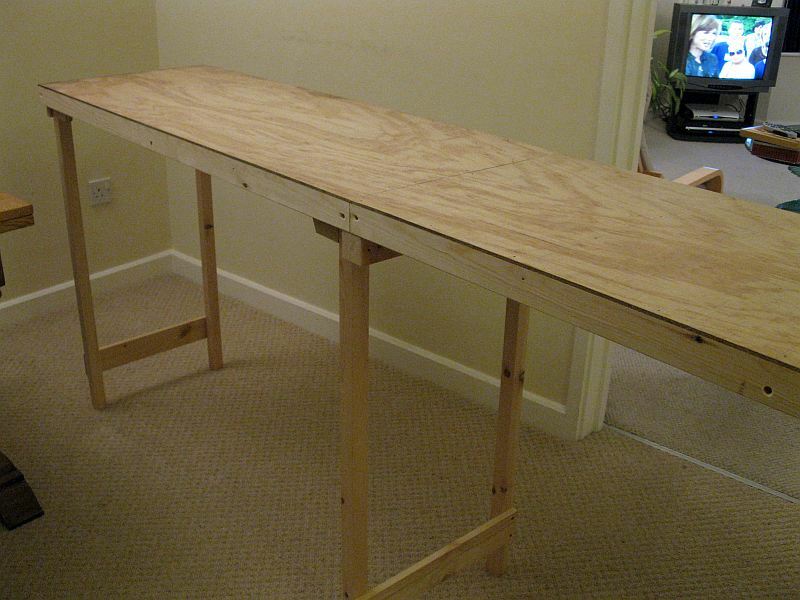 When assembled they make a surface area of 8' x 1' 6''; plenty of space for a nice-sized layout. Ideas are still very much being formulated, however a small terminus station with carriage sidings looks to be on the cards...certainly there is enough space to make something interesting. Nice bench work Claude. Is this room where the layout will go? 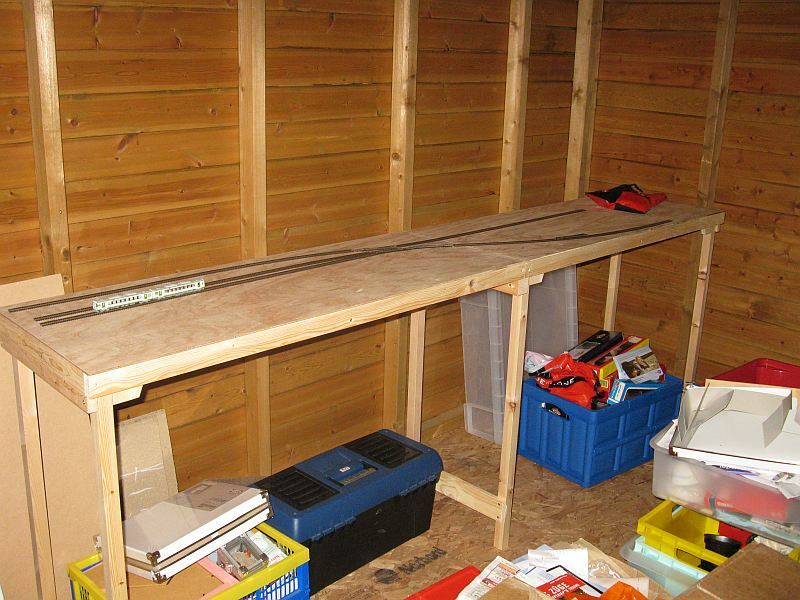 If I remember correctly in your new house you were thinking of using the garage for your layout? Boy, is Mrs. Dreyfus in for a surprise when she returns. Do you think she'll notice the layout in the dining room? I'll be following this, there is not so much terminus layouts around here. I hope to see soon some pictures of your tryouts and temporary set ups... as well as and some videos documenting the operational side of things. As mentioned in that article, there probably is not a modeller in the UK whom Cyril Freezer has not had some influence upon. To be honest I cannot think of one individual who has had a bigger influence on the development of model railways. Aside from the innumerable track plans that can be seen time and time again in UK models, he was one of the main drivers for moving model railways away from the two extremes of either a simple train set, or serious model engineering, to the sort of modelling we take for granted now. He espoused good reliable running, with a sense of reality within both operations and appearence. I have lost count of the number of Minories derivations there have been, and yes all my small terminus plans can trace their ancestory back to his designs...albeit with an attempted Japanese twist. I'll keep having a play with ideas, however the basic premise of a small terminus - now looking as if it will have three platforms - and small freight yard will remain. I like the idea of having the sidings in front of the hidden sidings...it's a better use of the space available. Also the intention is to exhibit this layout once constructed. I will always argue that any layout constructed should be portable, even if it is the intention not to move it...house moves etc. can lead to years of work being lost of you cannot shift the thing. I've always been a bit of a sucker for exhibiting...a kind of 'Look what I've done Mum!' pride, that is if it looks good and operates well...it gives me a buzz; I like playing trains; I like talking about model railways. I'm looking forward to seeing what you come up with, Claude. Might try something similar. Claude--I forgot to ask: on the plan you attached above, where are the hidden sidings? At the top right? Claude, it looks like you have a nice "acorn" there that has all the possibility to be a nice operation. Personally I prefer the British approach to home model railways, which seems to favor compact and practical, yet realistic linear operation, over the North American and European (and Japanese, for that matter) tendency towards "tail chasers". 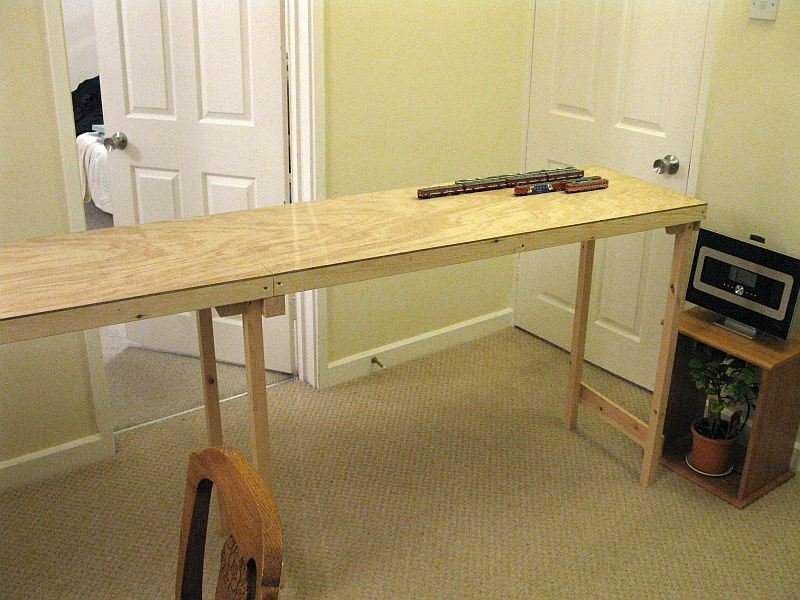 Though perhaps this is an outcome of cramped hobby spaces. 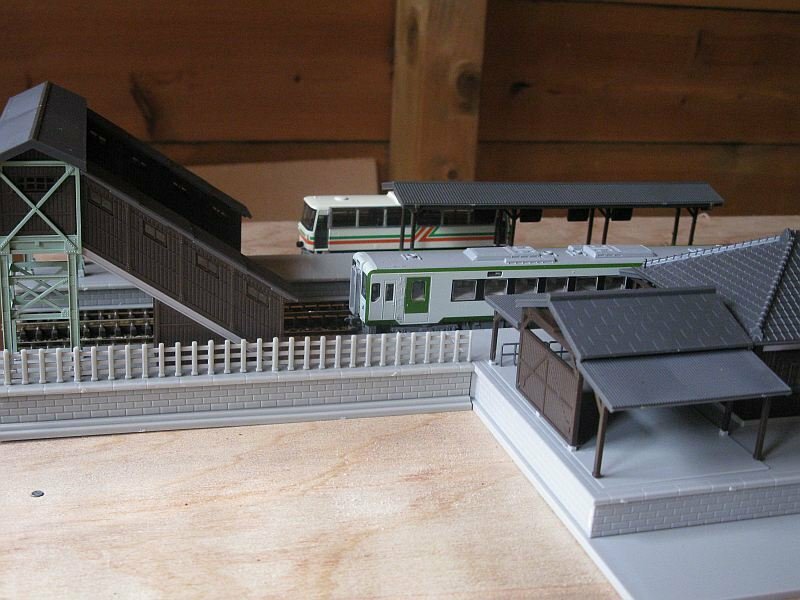 Anyway, I wish more modelers in Japan would look into building operational terminus layouts (or through stations w/fiddles/staging)- certainly there are many examples of static dioramas that are stunning in their execution here. Being emus, I don't think much modification would be required, other than making sure your platforms can accommodate typical consists and adding simulated catenary. I don't know how much you like to model signaling, but with emus, which are fitted with ATS, simulated color light signals would be nice. With a diesel only operation, tablet working would be adequate, and semaphore signaling used, or eliminated altogether. Yes, in that plan the hidden sidings are on the top right. It is similar in parts to questions I have posed on here in the past and essentially deals with small electric locomotives. The design of this layout is to have a small three road freight yard. Normally it will be diesel-operated, and that's easy...I already have a number of DE10s for this purpose. What I would like, however, is a small electric locomotive for some operational interest. I'm not looking at one of those tiny 4-wheelers that seem to be around, more something along the lines of an ED62. Research suggests that the Tomix ED62 is as rare as rocking-horse droppings, and pretty much impossible to get hold of. I don't understand a word of Japanese, and my computor set-up is somewhat arcaic so I cannot even upload Japanese characters...this essentially rules out about 90% of the results in Google - which also won't translate for me! I may be able to get hold of an ED61, however it looks like this class was withdrawn back in the 1980s, which is a little early for me. The ED73 and 75 I suspect are a little too northern for me...I am looking for something more towards the JR central area. Whilst I could run something like an EF64, and could possibly get away with it, it is a little too big in the context of the layout size. If there is nothing available at the moment (research suggests this may well be the case) then I'll have to wait...and keep my eyes open. Here's a few Japanese terminals, unfortunately all passenger. These would probably have to be condensed for your layout. You can try to find a Chichibu Deki 300 (http://www.1999.co.jp/eng/10055614). If this train has something to do with the city of Chichibu it will then geographically fit with your JR Central area. There is one loc on Yahoo Auctions right now. 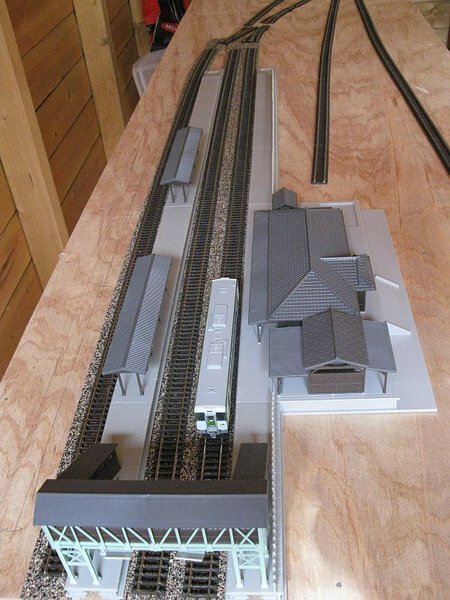 You could model a station where the private railway exchanges freight with JR, a smaller version of Yorii on the Chichibu, although it's not a terminus for either line. The ED61s were all rebuilt into the ED62s for the Iida Line. The ED62s replaced the mixture of ED19s and ED18s on freight workings. The Micro Ace ED19 is too long. The ED18 is available from Wellington Models but is probably too early for your period. ED73s were on Kyushu while the ED75s were AC only. The ED17 is also available but I cannot remember when these were withdrawn by JNR/JR. Of the brown electrics the EF15s were the last of the freight types to be withdrawn. There is a new Kato version for 2010. Private electric locos have been offered by Micro Ace as has been pointed out earlier. Well, the boards have now been set up in their rightful home, and a short trip down to my local model shop resulted me returning with a few lengths of track, four points and some Kato platforms. The decision has been taken to use code 80 track, as this looks a little more 'narrow' in comparison with code 55 - ideal as I am trying to depict 3'6'' gauge track. The station will now be a three platform affair, with two roads electrified...you can see that the idea is slowly evolving away from my original premise, which is fine...we are still in the planning phase... 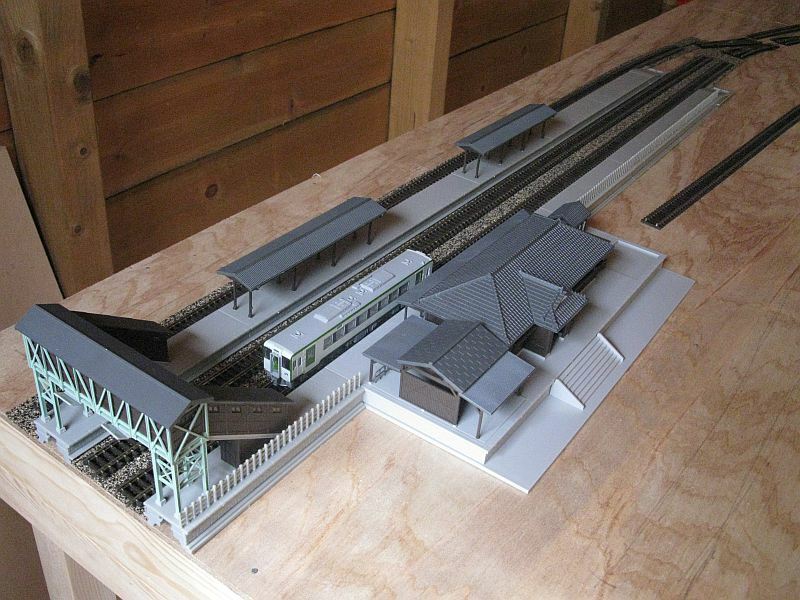 There will be a three siding yard to provide a little more operational interest. To start with this will be diesel; however when a suitable electric loco becomes available the catenery may go up here. I'm waiting to see if Tomix will re-release the ED62, which is essentially what I have in mind. 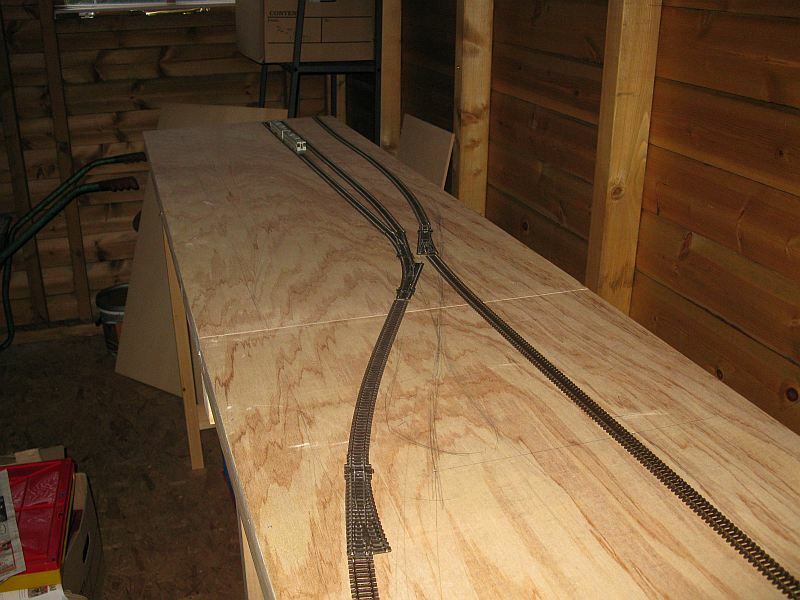 Currently the track has just been placed upon the boards, as I refine the plan. Looking the other way, the point in the foreground will be in the fiddleyard, whilst the track running beside, to the right, will feed the freight yard. Tomix have removed the ED62 and others with the older type chassis from their catalogue. You may have to be patient or seek a secondhand version. 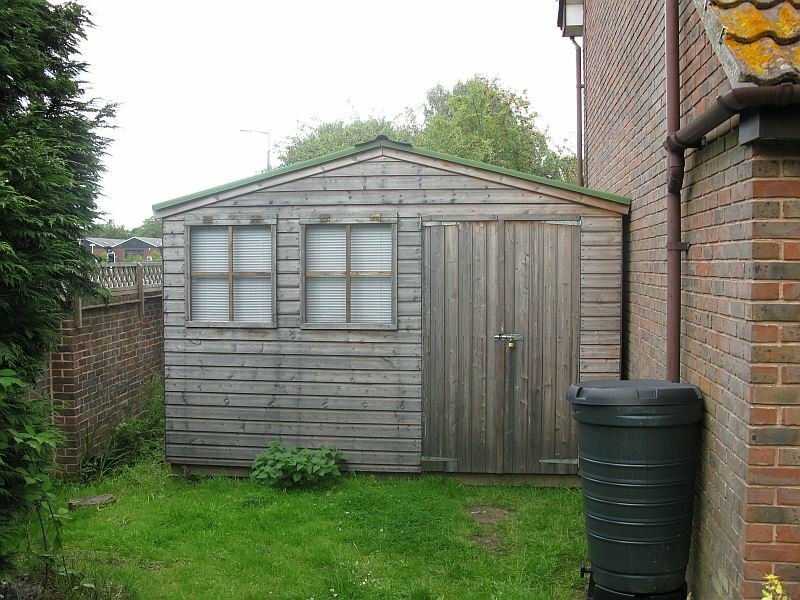 I guess it wasn't had to move and the shed looks pretty roomy! Looks like a good base for a layout. 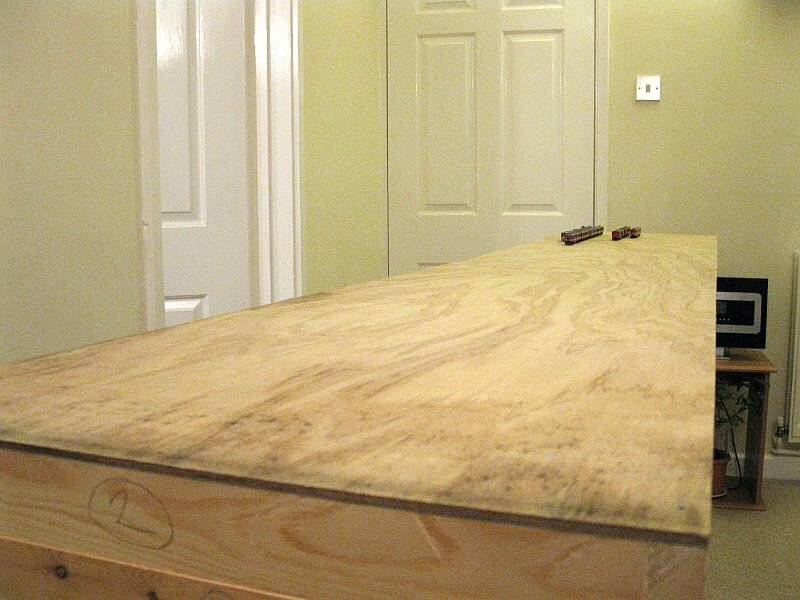 If, as seems likely, the shed is subject to humidity changes over the course of the year, you may want to seal the wood of the table top and frame, to limit the amount it can expand/contract. Otherwise you could have future problems with track alignment. A couple of coats of a good housepaint primer (exterior or interior) should do it. It's been a while since I last updated on this. I am in a bit of a chicken and egg situation here in terms of track clearances, switches etc. What I have needed to do is construct the station and platforms, however not fix them down, before the track gets put down. I have sufficient points and trackwork for the station area. I have used the standard Kato rural station with platforms, and over the course of construction I have found that, not suprisingly, it is designed for Unitrack and therefore the platforms are too high for the PECO code 80 I am using...so to remedy this I am having to use a cork underlay to raise the trackbed. The Kato station is a very impressive model, although I am wondering if the plaforms are just a little too narrow. Hopefully the accompanying pictures will give a good impression of what I am aiming to acheive. Just a quick nitpick: If this is a terminus, isn't the overhead walkway overkill? Otherwise, I think this is going to be a very nice-looking layout! Looks like it can be converted later to a through station, 'mirite? Looks very nice. Japanese platforms can be really narrow though. Especially if there aren't any kiosks or waiting rooms on it. I have intended it for possible extension to a through station at some point in the future, or at least given myself the option if I want.